“`On April 3rd, the Los Angeles Dodgers is kicking off the 2017 season minus a key member of the personnel. Legendary sportscaster Vin Scully will be absent from their broadcast booth for their first time in 67 seasons. “`Not that our City of Angels would ever forget the voice of Dodger’s baseball. California Assemblyman Jimmy Gomez has taken action to immortalize the Hall-of-Fame announcer by renaming bits of highway after him. 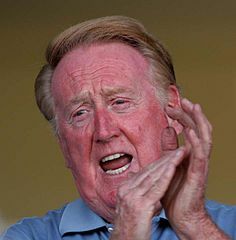 The politician has introduced a bill to the California State Assembly, which re-christens a two mile stretch of the 110 Freeway near Dodger Stadium: Vin Scully Highway. Gomez’s resolution asks Caltrans to look into the cost for a new stretch of signs between the Interstate 5 and 101 freeways. The signage update could be funded by outside donations. “`This would be Scully’s first freeway, but not his first street. In spite of the broadcaster’s modest objections, the Los Angeles City Council, last year, changed the name of Elysian Park Avenue near Dodger Stadium to Vin Scully Avenue. “`The fitting honors for the remarkable Vin Scully (above) keep on comin’. “`Film historian and author Betty Lasky (right) was the daughter of Paramount Pictures co-founder Jesse L. Lasky. She developed an interest in film history at a young age, and began her writing career as the screen story analyst for RKO Studios, The Selznick Company, and Hamilburg Agency. “`Betty contributed articles about Hollywood to Players Showcase Magazine in the 1960s. In 1983, she published a book called RKO: The Biggest Little Major of Them All. She also donated a vast collection of her dad’s artifacts to the Academy of Motion Picture Arts and Sciences’ Margaret Herrick Library in Beverly Hills. 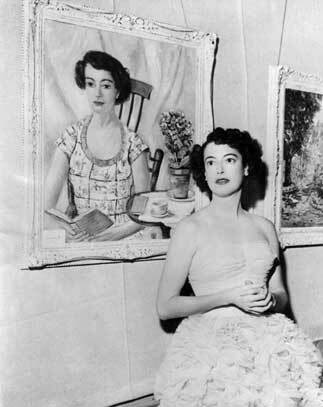 Her late brother was a screenwriter of over 50 films, including a long partnership with the DeMilles. This entry was posted on Thursday, January 12th, 2017 at 12:40 pm	and is filed under Blog by Manny Pacheco. You can follow any comments to this post through the RSS 2.0 feed. Responses are currently closed, but you can trackback from your own site.